Governor Lisa Honan, who has overall responsibility for the Public Service, this morning, Friday 18 January 2019, at 10am, received a petition entitled ‘Keep Doctor Rhys’. 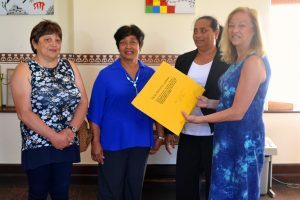 The petition was delivered to Governor Lisa in Her Excellency’s Office at the Castle by three members of the public namely Melvina Fowler, Veronica Augustus and Tania Constantine. Governor Lisa will issue an official statement shortly.